This is the time of year when “seasonal produce” gets exciting. I live in the Northeastern United States so for months the local produce has been beets, parsnips, and potatoes. Ho hum. Our farmer’s markets are just now starting and here comes the RHUBARB. Hurray! Some people are thrilled when baseball season starts, I get happy over rhubarb. Rhubarb is strange looking and strange tasting. But, do not fear it. When you mix it with strawberries you get this wonderful sweet and sour flavor that you can’t find anywhere else. If you are trying to eat healthy and keep things low calorie, it is paramount that you don’t forget “flavorful”. Great flavor makes you want to eat whatever you cook versus that bacon double cheeseburger you can find everywhere. This compote is fantastic in yogurt, on pancakes or ice cream, or on its own for a great little dessert. It is like a cross between a syrup and a jam. I used the slow cooker because it makes it easy to cook it and the flavors meld nicely. Some of you are going to complain about my use of sugar for this recipe. I cut it as low as I could to get it to still be sweet. One quarter cup of this compote is only 51 calories which is pretty great when you compare to maple syrup (208 calories). Do you get excited about rhubarb? Do you think this would this work with Stevia in the Raw or Splenda in place of sugar? Beth B, my Mom and my Sister have bot made Rhubarb Cream Pie with Splenda, and it tastes good to us. Ooooooh thank you for this. I grew up loving rubarb, but never got my grandma's recipe before she died. Can't wait to find some and make it. Snack Girl, you are wonderful...even the husband thinks so! Please, remind your readers that the rhubarb leaves are poisonous!!!!!! Thank you! Thank you for this! Rhubarb is one of the best signs of spring. But hey, a quarter cup per serving??? I wish there was a sugar substitute that didn't taste like a .......well......a sugar substitute. I'm guessing you mean white sugar, Snack Girl? How about using coconut or cane sugar instead? It's still sugar, but a bit healthier version of the white stuff. I use 1/3 cup organic maple syrup, but think honey would also work well. It cooks quickly on the stove. I leave out the strawberries, preferring straight rhubarb flavor. I will try this the next time my husband comes in (he's a truck driver). Rhubarb is one of his very favorites! I will probably serve this to him with a pan of fresh hot biscuits!! Yum!! Snack Girl, do you think this recipe will keep at room temp so I can send some to my mom in TN?!! 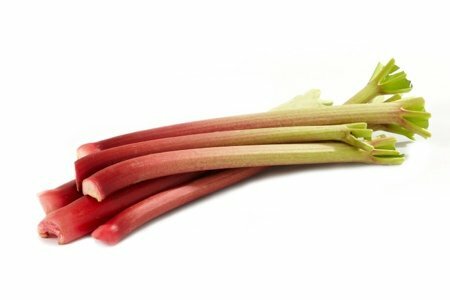 We used to eat rhubarb RAW as kids just dipping it in sugar (or salt for some weirdos!) with each bite!! And of course it's great cooked any way you make it. I make this stove top with rhubarb, strawberries (sometimes raspberries or both but I like that sour taste), and honey. I use honey to taste. It is AMAZING in overnight oats - I think it is by far my favourite way to eat them now. It's basically like eating dessert for breakfast every day! My mom used to freeze something similar without any trouble so I was considering trying to freeze my mixture towards the end of summer. Otherwise, we generally keep some chopped up rhubarb in the freezer as well as berries so you can make it any time of year.